TAB shouldn't delete input when there's no candidate. TAB should switch directories properly. require dired when completing file names, so that the directory face is loaded. TAB should work with confirm-nonexistent-file-or-buffer. TAB should handle empty input. work around grep-read-files: it should be possible to simply M-x rgrep RET RET RET. Fix the transition from a bad regex to a good one - you can input a bad regex to get 0 candidates, the candidates come back once the regex is fixed. ivy-switch-buffer should pre-select other-buffer just like switch-buffer does it. Fix selecting "C:" on Windows. counsel-git-grep should warn if not in a repository. C-M-n shouldn't try to call action if there isn't one. Turn on sorting for counsel-info-lookup-symbol. ivy-read should check for an outdated cons initial-input. ivy-re-builders-alist is the flexible way to customize the regex builders per-collection. Using t here, means to use this regex builder for everything. You could choose to have in-order for files, and out-of-order for buffers and so on. "pub" can expand to "Public License". In this case, I have avy installed both from the package manager and manually. I can easily distinguish them. Another cool feature is that instead of using find-library (which is also bad, since it would report two versions of avy with the same name and no way to distinguish them), you can simply use counsel-load-library and type C-. instead of RET to finalize. 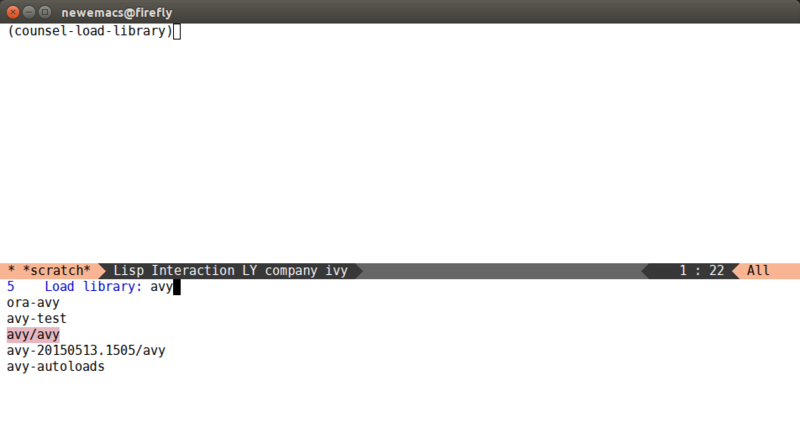 Here's another scenario: first load the library, then call ivy-resume and immediately open the library file. In regex terms, ^ is the beginning of line. You can now use this in swiper to filter your matches. This command is crazy good: it combines the best features of swiper (all matches an once, flexible input length) and avy (quickly select one candidate once you've narrowed to about 10-20 candidates). For instance, I can enter "to" into swiper to get around 10 matches. Instead of using C-n a bunch of times to select the one of 10 that I want, I just press C-', followed by a or s or d ... to select one of the matches visible on screen. So both packages use their best feature to cover up the others worst drawback. I was never a fan of recentf until now. The virtual buffers feature works in the same way as ido-use-virtual-buffers: when you call ivy-switch-buffer, your recently visited files as well as all your bookmarks are appended to the end of the buffer list. Suppose you killed a buffer and want to bring it back: now you do it as if you didn't kill the buffer and instead buried it. The bookmarks access is also nice. (setq recentf-exclude '("COMMIT_MSG" "COMMIT_EDITMSG" "github. *txt$"
All these commands just forward to their built-in counterparts, only trying not to exit the first line of the minibuffer. This is especially powerful for counsel-git-grep: you can easily check the whole repository for something with just typing in the query and holding C-M-n. The matches will be highlighted swiper-style, of course. Split only on single spaces, from all other space groups, remove one space. As you might know, a space is used in place of . * in ivy. In case you want an actual space, you can now quote them even easier.